Was this just a happy accident? Cobalt easily “bleeds” in the glaze melt if you’re not careful. But the subject of blue and white’s addictive appeal fills entire libraries. That appeal was in full swing long before Flow Blue appeared. Additional ammonia and calcium in the ink made the blue really flow. There was nothing accidental about it. 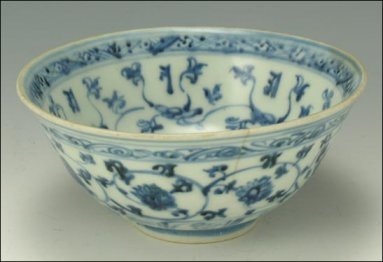 But Stoke-on-Trent potters who began this madness were happy that Flow Blue hid faults in decoration, glazing and firing. Some Flow Blue was indistinguishable from regular transfer print ware, blue but hardly ‘flown’ at all. Such variations merely exemplified how the period’s myriad decorative styles were driven by economics; mass production begat mass marketing which begat mass consumerism. The result? A fundamental change in how we approached the dinner table, how we took our tea. 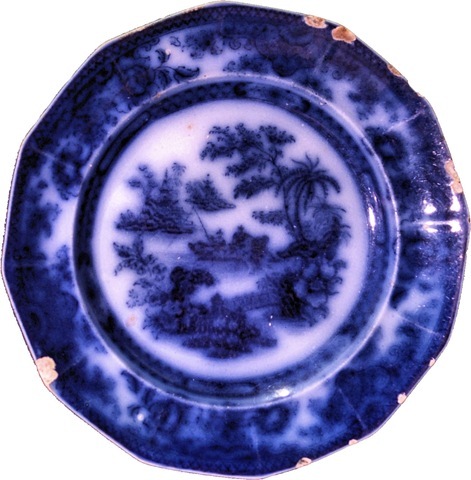 The other day I added to my meager “poor man’s” collection of early pottery with a set of cracked, chipped Flow Blue plates (Joseph Heath, “Tonquin” pattern, 1840-1850). Super cheap because of the cracks. But they are addictive. I feel their presence without even looking at them. They sit on my shelf, a throbbing reminder of a time when pottery defined an era. Flow Blue. A Collector’s Guide to Patterns, History, and Values. Jeffery Snyder. Schiffer/Atglen PA. 2004.